We are always happy to receive feedback from our customers and of course are absolutely delighted when that feedback is incredibly positive. Recently our Warwick depot has received just that, with thank you letters received from The Rotary Club of Warwick and Warwick Town Joint Bonfire Committee. 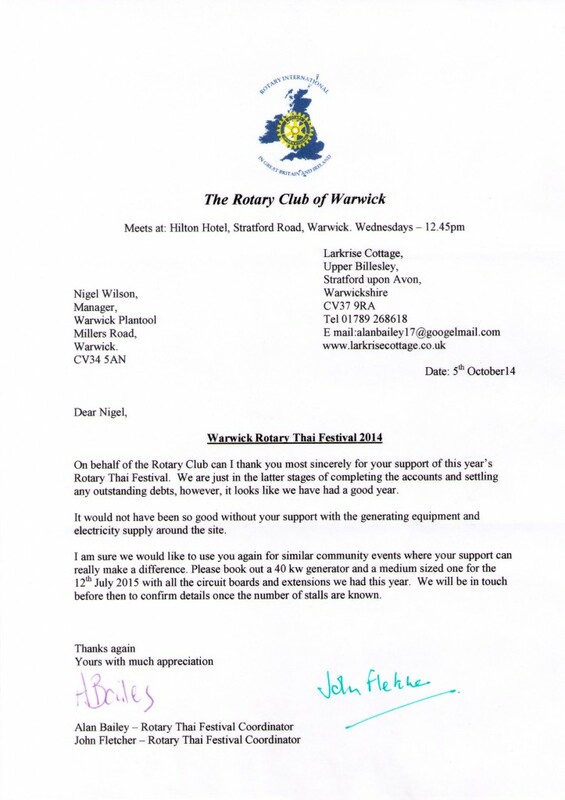 The letter we received from the Rotary Club of Warwick is in relation to the Warwick Rotary Thai Festival that they recently hosted. Alan Bailey and John Fletcher from the Rotary Club wrote to us to thank us for our support to the festival and for the generators, distribution equipment and security equipment that we supplied to them. And because they were so satisfied with the equipment they hired this year, they have already requested that we reserve the same equipment for next year’s festival. 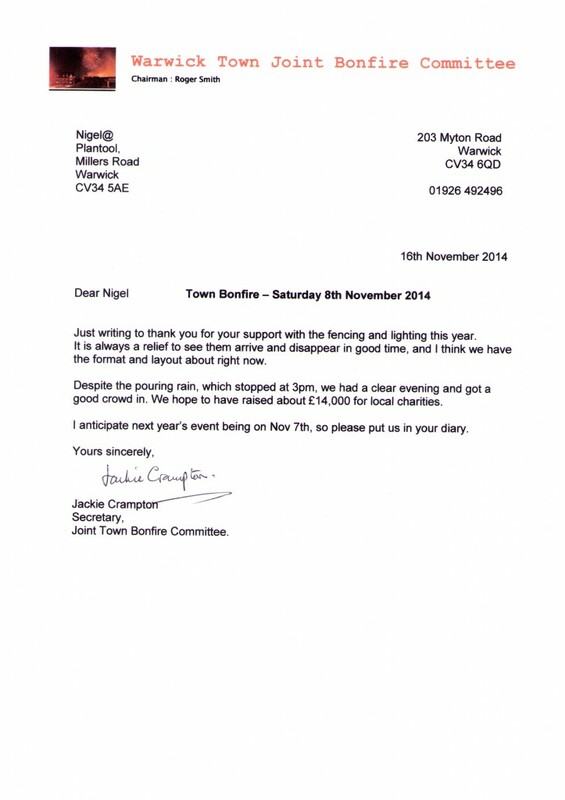 The second letter we recently received is from Warwick Town Joint Bonfire Committee thanking us for the equipment that they hired for the recent town bonfire and also for the support we gave them at the event. To the charity event, we provided steel pedestrian barriers, flood lights and various generators. In her letter, Jackie Crampton from the Committee praised us for getting the fencing and lighting put out and put away in good time. It was also great to hear that they hope to have raised about £14,000 for local charities from holding the event. To find out more about this recent feedback, you can read the letters for yourself by clicking each of them below. While should you be interested to find out about the equipment that The Rotary Club of Warwick and Warwick Town Joint Bonfire Committee hired, you can also do so below. If you have any feedback about equipment you have hired from us, then be sure to let us know. We are always happy to hear what you like about our service, how our equipment helped your project or even what could have been better.